Ellington Airport may find new life as a spaceport in the not-too-distant future. That’s the dream of Houston Director of Aviation Mario Diaz – a dream that’s shared by Houston Mayor Annise Parker. Diaz unveiled his bold futuristic plan when he delivered the keynote address for Commercial Spaceflight Federation’s annual conference here at a session at Space Center Houston that also included members of Bay Area Houston Economic Partnership, the aerospace and aviation industries and the public. “How does the city dubbed Space City USA in the last century hold on to that title in the 21st century? We think this is the answer: the Houston Spaceport,” Diaz said as showed renderings of what the Ellington of the future could look like to the audience, which included Johnson Space Center Director Dr. Ellen Ochoa. The concept drawings include a sleek-looking passenger terminal, space for businesses, even an aviation museum. They would all be built on some 450 acres of land available at Ellington. 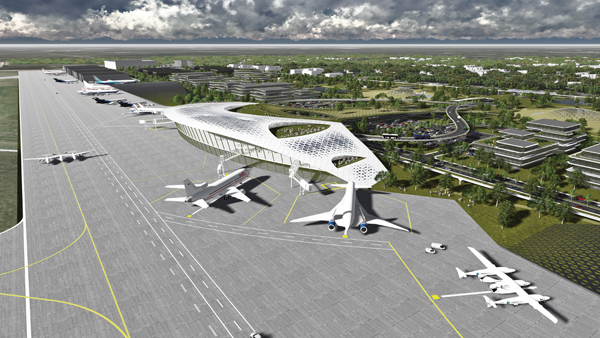 The spaceport would provide flights for tourists from a terminal similar to today’s airports, with people boarding and taking off much as they would in a regular airplane. Days earlier, Mayor Parker announced that Space City had applied for a license to build the nation’s largest spaceport not far from NASA’s Johnson Space Center in the Clear Lake area, which is home to more than 50 aerospace companies. The full cost of the spaceport has not been determined but Diaz said it would be paid for by funds from the private sector, city bonds and federal grants. And, it may take many months to obtain a license. There are currently eight licensed spaceports in the United States, including those in California, New Mexico and Alaska. The Texas cities of Brownsville and Midland are reportedly working on spaceport proposals. Afterwards, the Federation President Michael Lopez Alegria hosted a panel discussion by five former astronauts – Chris Ferguson, Jim Voss, Garrett Reisman, Jeff Ashby and Rick Searfoss — who now work for companies developing commercial space flight vehicles such as Sierra Nevada Corp., SpaceX, Blue Origin, Orbital Sciences and Boeing and who expect their companies to soon be flying to and from the International Space Station or into space.